In an article published in JAMA, researchers at Beth Israel Deaconess Medical Center examined the unintended consequences of the Hospital Readmissions Reduction Program, a component of the Affordable Care Act that began in 2012. Patient experience is five times more likely to influence brand loyalty than conventional marketing tools such as billboards, or television, print, or radio ads, the report says. More than 1,000 adults were surveyed for the report. The research features an examination of 184 narratives from patients or family members about diagnostic errors collected in a new database maintained by the Empowered Patient Coalition. The framework and tool are designed to help the approximately 80,000 health system trustees in the U.S. navigate the complex world of overseeing quality. While recognizing the value of many traditional utilization management processes, including labor productivity, staffing ratios, bed type assignments, throughput initiatives, and supply chain management, the team’s goal was to find new opportunities for improved resource management in bedside care delivery. Our center, the 206-bed Moffitt Cancer Center in Tampa, was still experiencing falls despite having a comprehensive fall prevention program in place. Prior to implementing the AHRQ (2013) fall prevention toolkit the same year of the toolkit’s release, we recorded 160 patient falls. After our nursing division implemented the toolkit, we recorded 143 patient falls. Could Legally Mandated Racial Bias Training Reduce Maternal Mortality Rates for Black Women? A 2016 analysis of data published in Obstetrics & Gynecology showed a dramatic worsening in U.S. maternal mortality rates, increasing from 18.8 per 100,000 live births in 2000 to 23.8 in 2014. The researchers pointed out that this increase of nearly 27% took place in the United States while global rates fell by a third around that same time period. The data becomes even more pronounced when examining maternal mortality rates for black women. Is Your Hospital Discharge Planning Failing Patients? 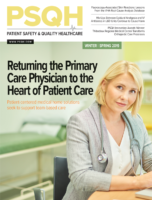 An estimated one in five hospitalized patients are discharged to post-acute care settings such as skilled nursing facilities or long-term care hospitals. Researchers at The Ohio State University found that a nurse’s “subjective workload”—which could include everything from the mental pressures of the job to relentless time constraints—affects her or his ability to provide optimal care, no matter how many patients they’re attending.